"Now the big one: Why is all of this being done? What have they built you to do?" In these days of terrorism, of beheadings on the web, of vengeance perpetrated seemingly at random in the name of the deity of one's choice, there's something almost downright quaint and old-fashioned about Cold War paranoia. Even political assassinations seem like part of our past, not our present; for most Americans, the deaths of President Kennedy, or his brother Robert, or of Martin Luther King are as personally resonant as that of Archduke Ferdinand. Hollywood still hasn't figured out just what to do now that the go-to bad guys of choice, the Communists and their Evil Empires, have been largely relegated to the dustbin of history. (Just how Jonathan Demme and his team overcome this obstacle in their upcoming remake of this movie is one of the great tantalizing questions of the summer of 2004.) 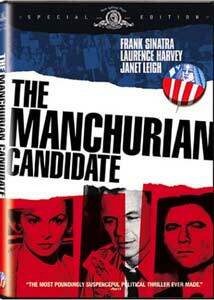 But that doesn't mean that The Manchurian Candidate has lost any of its tension and psychological drama; in this very well presented DVD release, it seems more than ever like one of the great films of its time. The central figure of the story is Raymond Shaw, decorated Korean War veteran, recipient of the Congressional Medal of Honor; he's a hero�just ask any of the men who served with him, and you'll get the same canned response: "Raymond Shaw is the bravest, kindest, most wonderful human being I've ever known in my life." In truth, though, he's a prig, and there's trouble at home. His father has died; and his mother (Angela Lansbury) has remarried�her new husband, Senator John Iselin (James Gregory, a good actor in his finest hour), loves to blather on about the international Communist conspiracy, as long as the cameras are running. The Iselins figure that Raymond will be their perfect campaign prop; but he's got his own ideas. He also has nightmares, ones identical to the men with whom he served in Korea; chief among them, for our purposes, is Captain Bennett Marco, played by Frank Sinatra at the height of the Rat Pack years. Sinatra picked up his Oscar for From Here to Eternity, a part he allegedly won with the help of some friends of ours (cf. Johnny Fontaine), but this film is probably his best performance, in part because it's not a movie-star turn�it's all in service to the story, and it's a great story. (There are occasional instances when the actor and character don't quite mesh up, though. Marco is supposed to be a bookworm, but you can feel Sinatra trying extra hard and not quite succeeding in making some of this sound natural�it's a long way from singing Luck Be a Lady at the Sands to getting over lines like: "It's rather like listening to Orestes gripe about Clytemnestra.") Discussing any more of the plot will spoil the pleasure of discovering the story for those who haven't yet seen the film; but it's easy to admire the craft that went into making this for even the uninitiated. Director John Frankenheimer has a steady hand throughout, bringing the improvisatory energy of the golden era of live television to a rigorously structured tale, well told in the script by George Axelrod, based on the novel by Richard Condon; extra special kudos to legendary production designer Richard Sylbert, who makes seamless transitions from an interrogation chamber to a garden party and back again, all so elegantly done. Laurence Harvey as Raymond does good work in a rough role; this isn't a likable character, and is frequently an automaton, but Harvey manages to humanize him. On par with Sinatra's excellent work is that of Angela Lansbury, who is fantastically menacing as Raymond's mother. If all you know about her is that she played Jessica Fletcher for a hundred years, you'll be floored; she's extraordinarily good here. (The story goes that the film was suppressed for decades, because of its tendentious relationship to the historical circumstances of the years that followed; Sinatra maintained, though, that his friend JFK loved the book, loved the idea of it being a movie, and only wanted to know who was playing the mother.) And though her name is above the title, Janet Leigh has very little to do, though she does have some strong scenes as Sinatra's love interest, a brooding, needy take on the conventional boy-meets-girl storyline. There's a pretty sentimental, almost maudlin streak to a film that at times can seem so jaded; but its moodiness may be its most salient attribute, and when the political conventions take place later this summer, especially with the Republicans convening at Madison Square Garden, it will be hard to put The Manchurian Candidate too far out of mind. Image Transfer Review: Lionel Lindon's noirish cinematography looks as smoky and elegant as it ever has; it also makes exquisite use of the deep focus capacity of black-and-white. The transfer has been handsomely done, with only occasional bits of debris or bacterial decay. Audio Transfer Review: Very clean audio tracks; the 5.1 remix sounds fine, but it's the mono track that I'd recommend, to get a sense of just how cannily Frankenheimer and his team mixed this back in the day. Extras Review: The late John Frankenheimer (he died in 2002) contributes a commentary track, one ported over from a previous DVD release of this film; it's pretty arid, unfortunately, with the obligatory discussions of the project's genesis, tales of location shoots, working with Sinatra, and so on. There's not a lot of spark to this, which is a shame; only diehards need listen. Frankenheimer demonstrates a whole lot more flair in a shorter running time in a 1988 discussion (07m:48s) with Sinatra and Axelrod, in which the three of them free associate; it's especially delightful to see Sinatra in such fine fettle. Newly produced for this DVD release are two more featurettes�the first and better of the two features Angela Lansbury reminiscing about the experience; it's called Queen of Diamonds (14m:49s). A Little Solitaire (13m:15s) features Frankenheimer confidant and prot�g� William Friedkin discussing the director's work on the film; his admiration for Frankenheimer is boundless, but there's not a whole lot to this one. A swanky release of a moody, smart, atmospheric Cold War thriller, one of the great political films ever to come out of Hollywood. It's worth stuffing the ballot box for this one.